It’s winter – bring on the reds! Unruly Red 2011 – California Red Wine Alcohol 13.5% by Volume; $14.99 per bottle, bought on a 5cent Sale at BevMo! On the Label: “Unruly Red has massive red fruit aromas with colossal flavors of plum, black cherry, and blackberry. My Take: Well, the label is at least a brief attempt at being humorous. Either that, or they put the Australian label on the American release – not sure which. At any rate, it is much as advertised – a relatively big wine that is on the lighter alcohol content side of things. It would go well with chili. Spicy curry. Any food that needs cutting through with alcohol. Because while this is a fairly big wine, it’s not an easily classified wine – my tongue can’t pick out the dominant grape (okay, not that I’m that good because I’m not but still…) and it’s what I would classify as a fairly good all-around red blend on the hearty side. Not a good wine with delicate foods. My Rating: ~ Drinkable ~ but not one I’ll likely buy again, at least not at full price. On the Label: “Flavors: plum, blackcurrant & raspberries. Enjoy: with your favorite pasta dish & good conversation. 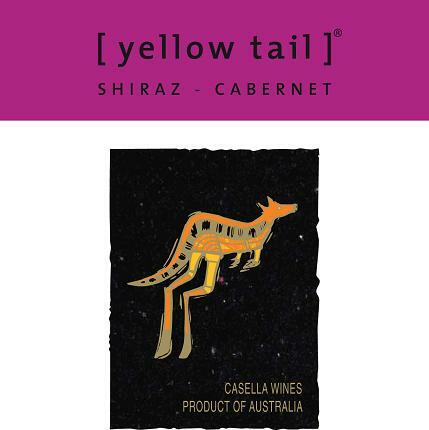 “For 3 generations the Casella family has been making wine at their winery in the small town of Yenda, situated in South Eastern Australia. It is here that [yellow tail] is created with a simple purpose in mind: to make great wine that everyone can enjoy. My Take: I am coming to really enjoy Shirazzy wines. If you like the Shiraz style, it’s my bet you will like this wine. Went great with steak. My Rating: ~ Very Drinkable ~ especially for the price. 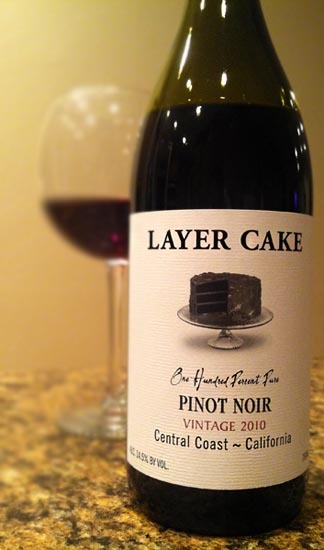 Layer Cake One Hundred Percent Pure Pinot Noir Vintage 2011 Central Coast ~ California Alcohol 13.5% by Volume $14.99 at my butcher shop/fish monger, Green Acres. My Rating: ~ Very Very Drinkable ~ I’m looking forward to trying more Layer Cake wines. Today I’m also over at Kate Evangelista’s blog, talking about my five favorite Christmas songs – feel free to hop on over, and join in the giveaway! Hope to see you there! This entry was posted in Wine Friday and tagged [yellow tail], Green Acres, Kate Evangelista, Layer Cake, Ocean Fresh, Pinot Noir, Shiraz, Smoking Loon, Unruly Red. Bookmark the permalink. 5 Responses to Brrr….Pass Me a Red Wine, Please! I’m having our Hanukah dinner tonight and expect to consume some great wines. I like a Shirazzy wine too. You’ve talked me into trying the Yellow Tail Shiraz/Cab! Christine, love, love Layer Cake wines! Their Primitivo is fabulous, but in the Midwest, the only place I can find it is Trader Joe’s and it’s sketchy there. I’ve never tried their Pinot, although I’m a Pinot pushover–I love Pinot Noir! I’m heading to TJ’s to see if they have any. Yum. I am going to go and find the layer cake pinot. It sounds perfect for Christmas. Hey Christine–I just had that Layer Cake Malbec and it was very drinkable too–I’ll have to check out the pinot!